Two stabs for Alicia on Fear the Walking Dead. If you haven’t watched Fear the Walking Dead in a while, this new trailer is going to be surprising. The first half of the fourth season started with a big change and now it’s just getting more and more permanent. Many of the characters are new; Kim Dickens’ main character Madison is gone. There’s a much grittier, grosser vibe. And, as you’ll see in its new trailer, there’s also a storm so bad zombies start flying through the air. 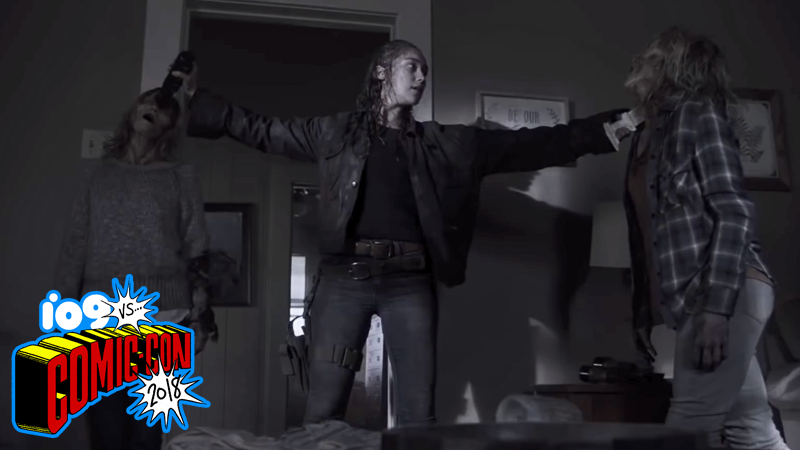 Executive producer Scott M. Gimple described the back half of season four as “Sad, funny, strange, beautiful” as well as “scary and screwed up.” To be fair, the footage shown today backs that up pretty solidly. Starring Alycia Debnam-Carey, Lennie James, Jenna Elfman, Maggie Grave, Garret Dillahunt, Colman Domingo, and others, Fear the Walking Dead returns on August 12.